... is a vessel for adventure, solitude, friendship, opportunity, departure, pilgrimage, hope, labor, determination, questing, sorrow, high spirits, wonder and poetry. 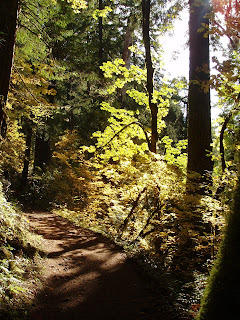 Here is a stretch of Eagle Creek Trail I hiked in October. Write about a trail.